Low Carb Maple Pecan French Toast CasseroleWe know just as well as you do that breakfast food is the bomb. Of the many wonderful breakfast foods, french toast is definitely a classic. We have developed a recipe that reinvents the idea of boring old french toast. 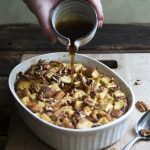 This low carb maple pecan french toast casserole is a fresh, new take on your traditional french toast recipe! Smear the butter on the inside of a 1 1/2-quart casserole dish. Beat the egg yolks, half and half, cream, granulated erythritol, liquid stevia, vanilla, cinnamon, nutmeg, and salt together in a large bowl. Add the bread cubes and toss gently to coat. Pour the mixture into the prepared casserole dish, lightly pushing down the bread so it’s mostly submerged in the liquid. Preheat oven to 375F. Get the casserole dish out of the fridge and let it sit at room temperature for 20 minutes while the oven preheats. Bake the casserole (covered with foil) for 50 minutes, and then remove the foil, sprinkle the pecans on top, and bake 5 minutes. Serve warm along with maple-flavored syrup to drizzle on top. For the keto sandwich bread, 4 cups is about 1/2 of the loaf. We used Lakanto Sugar Free Maple syrup which has 10g sugar alcohols per 1/4 cup. Granulated Erythritol has 64g sugar alcohols per 1/3 cup.